When he has all the reasons to give up, Bright Kho, Chief Executive Officer of Mush Better, is determined enough to turn his interest in mushroom farming into a profitable business. Two years ago, he started to have an interest with mushrooms because of his former girlfriend. This led him to finally decide to visit a mushroom farm to know more about mushrooms. “Noong nakapunta ako sa farm, na-in love ako sa mushrooms.” (“When I went to the farm, I fell in love with mushroom.”) What he saw in the mushroom farm made him fascinated to do it as well. Together with his former girlfriend, they built a company dedicated to mushrooms. However, it did not take too long for him to leave due to management conflict. He could have stopped from there but his grit and perseverance help him to start again. 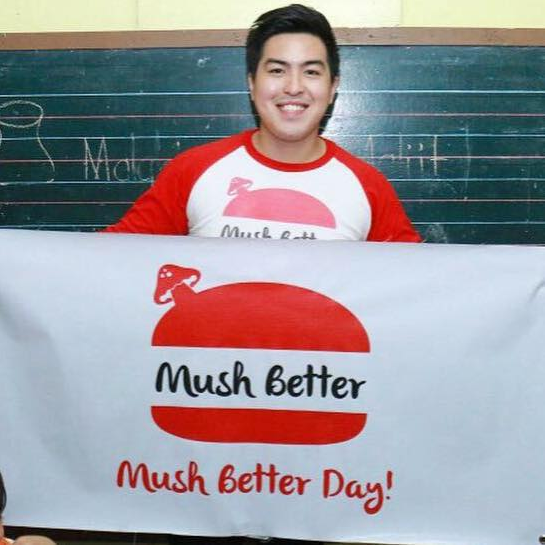 With the help of his college friend, he build his own company Mush Better Foods Inc., CBN-PH000000066 last year. But then again, he persevered. He went through negotiation to a huge supermarket in the Philippines for them to supply mushroom on their retail stores. After several attempt, he failed. Instead of being discouraged, he used the feedback from the managers of the stores to continue improving his product. It may look another failure again, but that experience led them to come up with their unique product called krispy mushroom. Though it was difficult at first to introduce the product, their relentless effort to promote the product landed them several clients. Fast forward today, Mush Better is now exporting their products to different countries such as USA, South Korea, Singapore, Finland, Dubai, Qatar, and Kuwait. Indeed, nothing worthwhile comes easy. There may be roadblocks along the way, but with grit, perseverance and positive outlook, everything can be conquered. Wow. Congrats po! Reminds me of Ittipat and his fried seaweed. More power to you sir!